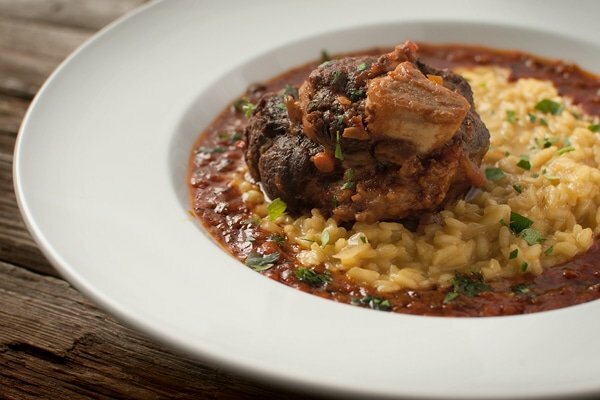 Osso buco, if you are not familiar with it, is a Northern Italian classic: Braised shank with a tomato sauce, usually served with risotto Milanese. To make it right, you need the shank of a large animal; little lamb shanks don’t cut it. Normally it’s a veal shank or pork shank, and yes, I’ve seen it with those little lamb shanks. But I mostly make osso buco, which means “bone with a hole” in Italian, with shanks from large deer, elk or even bear. 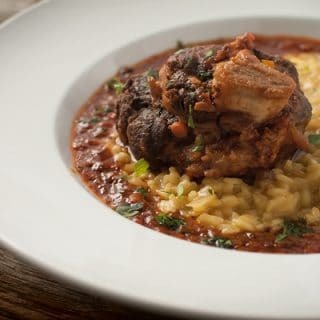 Making osso buco is straightforward: Dust the shanks in flour, brown in olive oil or butter (or lard), saute veggies and braise until tender with white wine and tomato sauce. 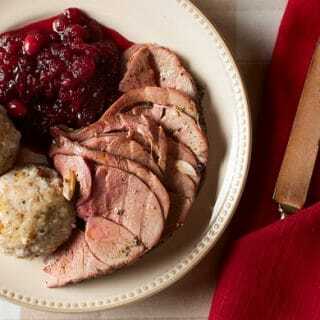 A veal shank might take 2 hours, one from an old moose or elk maybe 4 hours. And you don’t need to serve it with risotto Milanese. Polenta is a great alternative, as is a loaf of good, crusty bread. Just don’t forget the red wine at the table. You will have more sauce here than you need for this meal. My advice is to use it as a pasta sauce, maybe with homemade squash gnocchi. And if you have leftover meat, shred it up and use it as a filling for homemade agnolotti. Any sort of shank will work here. One important tip on dealing with large shanks: Use kitchen twine to tie them tightly while cooking -- this keeps them together and compact. Mostly it's for presentation, but if you skip this step you run the risk of the shanks falling apart in your sauce. Not always a bad thing. Make this dish when you have a little time, as it will always require at least 2 hours, and probably more. Good news is that it reheats beautifully, so you can make it on a weekend and eat it during the week. Preheat the oven to 300°F. Heat the olive oil in a Dutch oven or other large pot set over medium-high heat. Salt the shanks well and dust them in the flour to coat. Brown them well in the pot. Take your time and get a good browning on them, which should take a solid 10 minutes. Remove and set aside. Add the onion, carrot, celery and porcini mushrooms, and saute until slightly browned around the edges, about 6 to 8 minutes. Sprinkle some salt on them as they cook. Pour in the white wine and use a brown spoon to scrape up any browned bits on the bottom of the pot. When this comes to a boil, add the stock, crushed tomatoes, thyme, oregano, lemon zest and bay leaves and bring to a simmer. Return the shanks to the pot and turn to coat with the sauce. Cover the pot and move it to the oven. Cook until tender, between 2 and 4 hours, depending on the animal. Serve on top of risotto or polenta, or alongside some bread, garnished with the parsley. You can find more than 100 recipes for all cuts and all kinds of venison, right here on Hunter Angler Gardener Cook! Made this with elk last night, 5.5 lb shank fed 5 with leftovers. It was awesome. Took 4.5 hours at 325. Made the leftovers into pasta sauce today…holy smokes! Highly recommend that move! I’ve done moose-o bucco, each shank was cut 6″ tall and would feed 3-4 easily, just delicious. However, after 3.5 hours they were catchers mitt tough. I thought it was going to be a failure but gave an additional 3 hours at 250?, came out perfect.